Dental inlays and onlays are a medium between dental crowns and fillings. They are implicated on teeth that have suffered a moderate level of decay, where the damage is not severe enough to wear a crown.Inlays and onlays are usually made from porcelain/composite resin. Since they are created from tooth coloured materials, inlays and onlays are often used to replace a metal dental filling for patients who desire a more natural looking smile. Inlay/onlay placement is usually carried out over two visits. During your first visit to the dentist,an impression of your tooth & a temporary inlay/onlay will be placed over your tooth. The dentist will then send the impression off to a dental lab,which will create the inlay/onlay to match your tooth's specifications. When you return to your dentist's office,the temporary inlay will be removed and the permanent one will be placed carefully on your own tooth. INLAYS/ONLAYS-BENEFITS AND RISKS Since inlays/onlays can be made from durable tooth coloured porcelain, they offer much more enduring and natural looking results than metal fillings. 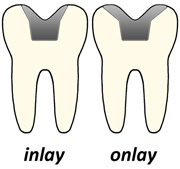 Although,no risks are seen to be associated with inlays/onlays, a small percentage of patients sometimes experience a mild degree of sensitivity after the placement of inlays/onlays. Such patients should avoid hot, cold, crunchy foods in the days following their appointment with the dentist.